A complete range of quiet and secure exit solutions! Commonly known as cross bars, crash bars or panic bars, exit devices are often used in high-traffic, commercial and industrial applications, because they allow for easy egress (especially in high occupancy and hazard areas) and are available with fire ratings up to three hours. 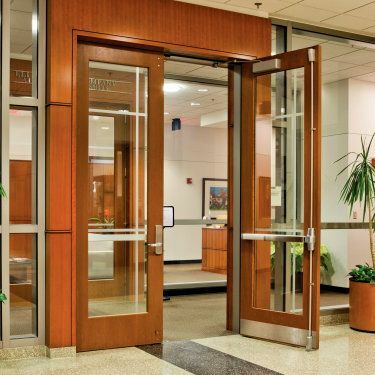 They are available in a number of configurations – including standard design, mortise design or concealed vertical rods – as well as a variety of trim and strike styles. Exit devices may incorporated into an access control system. Quiet latching technology makes them ideal for healthcare and education applications, where quietness is essential. Walsh also offers custom-designed push bars that can be used to promote your brand or team. As a result, they’re perfect for entertainment and sports venues – or wherever you’d like to make a brand-building statement. The photoluminescent bars are also available to meet all egress requirements and require no wiring, since they recharge through exposure to ambient light.